Having been in the profession, cooking for 19+ years, I have met many a culinary chefs, some of whom are chefs by profession, some are chefs by choice, while some are chefs by virtue of the legacy they uphold. And to be honest, I enjoy the company of street chefs and cooks, who have had this gift passed down from generations and hence I have always held a bias towards the modern fusion cooking-oriented Indian chef. On my last visit to Ahmedabad, the way I thought about a lot of things changed during a conversation that extended over three hours. Here I met a very proud 70-year-old halwai, Kamlesh bhai, who is the seventh generation torch bearer of Kandoi Sweets in Ahmedabad. 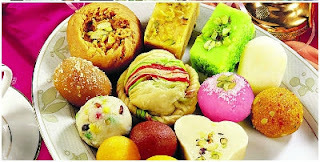 Started as a small weekly mithai stall in Manik Chowk, one of the oldest markets in Ahmedabad, they have come to be known as one of the biggest sweet makers in Gujarat. His son also into the business, is an MBA, who was forced to learn mithai-making early on in his childhood, a practice he doesn't regret. When I spoke to Kamlesh bhai on the presence of flavoured chocolates in every mithai shop in the country, I was expecting the usual outburst about how our traditional Indian food is being messed up. Instead Kamlesh bhai smiled, looked at me and said, "I keep chocolates in my mithai shop too." He shared how he's made a promise to his father, that "I will pass this legacy down to my son in a manner that is interesting and contemporary, so that he is excited to take the business forward and further the promise to his kin, who will be happy and proud of this culinary inheritance." He pointed out, "The only reason our business has survived for all these years is because we have handed over the reigns to our prodigy in the most appealing and current form. My son loves this business and is happy to take over from me not just because of the family pride but because its an evolving business. It is definitely not what it was 170 years ago." Kalmesh bhai insisted, "We have to be trendy if we want to be a part of history. However, while doing all this, we continue to hold onto the essence of our basic values." I was happy to read this blog... i want to make correction.... Rassogulah was not first made in west Bengal .... it was first made in Odisha... then it spread to bengal..